Imagination Playground, LLC, http://www.imaginationplayground.com, creators of the breakthrough play space concept that encourages child-directed, unstructured free play, announced this week the return of their unprecedented offer to schools and family centers—the Gift of Play. 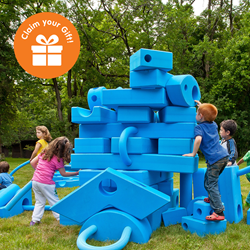 Gift of Play is Imagination Playground’s offer of help to the many schools that want a set of Imagination Playground Big Blue Blocks, but are unable to afford one. There is a growing global awareness of the many ways creative play aids in child development—problem-solving, collaboration, and language skills, for example. This has translated into a growth in the number of schools that want Imagination Playground. Imagination Playground first launched Gift of Play in Fall 2015, after receiving feedback from hundreds of schools saying they dearly wanted Imagination Playground for their children, but could not acquire enough funds to do so. Imagination Playground responded by offering these schools financial consideration at unprecedented levels, as well as advice and help on community fundraising. The program was quickly and overwhelmingly received, enabling Imagination Playground to reach its 2015 goal of bringing creative play to 2 million more children. According to Imagination Playground President and CEO, David Krishock, the decision to re-run the Gift of Play program this fall came in response to 582 schools who said they were waiting for the return of last year’s unprecedented offer. “There is a growing global awareness of the many ways creative play aids in child development—problem-solving, collaboration, and language skills, for example. This has translated into a growth in the number of schools that want Imagination Playground for their students. These schools—our partners—are asking for our help,” said Krishock. Imagination Playground’s company mission is to help children become more involved in purposeful, child-directed play. At the beginning of 2016, the company set a new goal to get 3 million more kids playing. Having already reached 2,121,000, Imagination Playground believes their renewed Gift offer will enable them to reach their goal by the end of the year. To contact Imagination Playground with questions about the program, reach out to contactus(at)imaginationplayground(dot)org or 1-678-604-7466. Imagination Playground is a breakthrough play space concept developed to encourage child-directed, creative free play. The kind of play that experts say is critical to children’s intellectual, social, physical and emotional development. Created by architect and designer David Rockwell and the Rockwell Group, Imagination Playground enables children to play, dream, build and explore endless possibilities. Imagination Playground finds its home in daycare centers, kindergartens, elementary schools, children’s museums—and science, nature, discovery centers, camps, community centers, children’s hospitals, hotels, public parks and more—in North America and over 60 countries overseas.